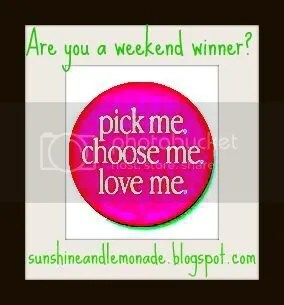 It’s week two of Kat’s giveaway over at Sunshine and Lemonade’s Ten Weekends of Winners Contest. This weeks theme is In the PINK. It’s a Pink theme and Pink always makes me think of Breast Cancer Awareness and that’s what this weekend’s contest prizes are all about. Better Homes and Gardens Limited Edition Pink Plaid Cookbook -So COOL! Two other lucky winners will get car magnets (and if you haven’t seen these, they are fabulous so go to Kat’s and check it out!) The contest ends next Friday so I want to see a lot of you over there signing up. I second you Blogging Mama, what a great way to get the word out! !TaTas RULE~! We must save them!